Pleasant weather? Wait for it. Weather watching is a part time hobby of mine. I like to study the movements of the jet stream, paths of storms, El Nino and his jealous sister, la Nina, which phase the North Atlantic Oscillation and the Icelandic low are in, how much of the great lakes are frozen over the course of winter, as well as other factors that all tie in together to produce our weather patterns. Yes, I consult the Farmer’s Almanac, as a guideline. I watch several different news and weather channels (and that is the extent of my television, unless there is a Pink Floyd documentary on). I put no stock, whatsoever, in Groundhogs (they are usually wrong). In weather, rarely is anything absolute. There are too many factors involved. Patterns are present, but these patterns are often so spread out over time that they go unnoticed by most. I am also moved to predict, on or about Groundhog Day each year, how much longer we will be locked in the grips of frozen slop. This year I purposely avoided making said prediction because I didn’t have much to go on. The ground was frozen, and had been for months. There was heavy snow cover and few days of full sun, even fewer days above freezing. I didn’t see any of the natural signs I look for. So when we hit a week straight of 40’s with a foray into the high 50’s in early March, I was surprised. Then again, I have seen long, cold, snowy winters before and recalled that they tended to break more sooner than later. On my way back from the store last Sunday, I looked across a sun lit copse of trees alongside the highway. Sure enough, I saw buds pushing on quite a few trees. Not much, but enough to change the look of the tree tops from dead sticks to sort of fuzzy. Sort of. Then rain, and a lot of it. Warm rain from the south. This is exactly the kind of thing that obliterates the snow and causes the emergence of spring peepers. 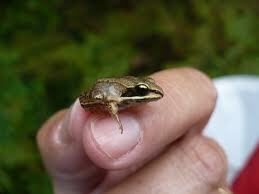 Spring peepers (Pseudacris crucifer, proper) are the harbinger of Spring for me. Folk lore says that if you hear peepers 3 nights in a row freezing weather is done with. For the most part, that seems to hold true. I listen carefully for their heralding chorus at this time of the year. So far, they have been silent. Forecasts call for another week of 40’s and, although not the best temperature for frolicking out-of-doors, it still equates to melt. The snow cover is retreating quickly, exposing flattened shrubbery and landscaping that was compressed by mounds snow and ice for upwards of two months straight. At least they were shielded from the bitter cold. Filthy mounds of snow, diminishing like glaciers with black lung disease, expose long forgotten items that didn’t escape the onslaught. As I write this, we have come out the other side of another relatively warm rain system from the south. But the temperatures have dropped back down into the 30′ and the peepers have not made an appearance. It would seem that at least one groundhog had enough of being dragged out of hibernation and forced into making a prediction on the arrival of Spring. Some ‘town father’ (asshat) up in Wisconsin leaned in to hear what the fat weasel had to say for itself and promptly got bitten on the ear. Score one for the rodent. The mayor, clutching his damaged lobe, then proclaimed that Spring would be early this year. Keep in mind this is in Wisconsin, a northern-most state with the (mostly frozen) Lake Michigan snuggling up on its right side and Lake Superior giving it a headbutt. Closer to home, Punxsutawney Phil, Pennsylvania’s celebrity ground weasel, indicated that there would be six more weeks of winter. In my backyard, there were no woodchuck sightings (and there damn well better not be). So, in my own style, let me say a few things to the mayor (I realize that you may be hard of hearing, but I will refrain from using CAPS). We don’t ‘listen’ to the groundhog. He predicts of his own accord. If Pennsylvania is predicting six more weeks of winter, Wisconsin will certainly experience at least the same, if not more. Spring will always arrive between the 20 and 22 of March, regardless of what your resident weasel-chuck predicts. Nothing short of a catastrophic asteroid strike on the earth will change that. Don’t put your fat head near the fat rodent. He is every bit as grumpy as you would be if woken up from a peaceful slumber. As is well documented here, rodents are not highly regarded. Not that they should be. After all, their gnawing, nesting, crawling around in dark places, pestilence carrying and general squeaky chitter-chatter are not endearing. And let’s not get started on that tail. On the hierarchical scale of things, rodents occupy the base levels. Somewhat above bugs; flying, stinging or otherwise, but quite lower than, say, a cute puppy or a furry kitten. Even a squawking bird is a rung or two higher. Rodents are the mammalian equivalent of squash – they have their place in the grand scheme of things, but you would reach for a potato or the creamed spinach long before the roasted spaghetti squash. One can easily see why rodents take the brunt of human dislike. No one wants a rodent around anymore than they want a steaming plate of poached pumpkin or baked Hubbard squash on the dinner table. Rodents, just like pumpkins, squash or gourds, make great targets. I can recall several times when the Birdcrew would purchase a few select sized pumpkins specifically for that purpose. Squash holds up quite well to marble strikes, bullets and arrows. You can use them over and over again. When you’re done, you can smash them, thus getting out some inner aggression, or you can throw them into the fire. Few people (that I know of) would have a problem with either a squash or a rodent being on the receiving end of a projectile. Just like squash, rodents are filled with yucky stuff. And they tend to linger – like that pumpkin that you leave on the front porch around Halloween. It slowly deflates into a leaking compost display until it needs to be picked up with a snow shovel. That, or you can wait until a hard freeze then chisel it off the step. The mouse whacked by the trap in the garage will stay there until it starts to smell, or the wife screeches about it. By then it will be somewhat less plump than when it was first discovered. Seems like there is always a rodent poking around somewhere – the mouse in the garage, the groundhog under the shed, chipmunks in the shrubbery, moles, voles and shrews in the backyard. Rodents and squash come in all sorts of varieties. The better to fool you with. 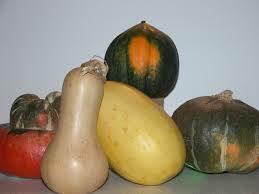 Acorn, butternut, Hubbard, turban, spaghetti, goose neck, pumpkin, green, yellow, summer, winter – all squash. Rats, mice, squirrels, woodchucks, rabbits, gerbils, hamsters, guinea pigs, chipmunks, moles, voles, shrews, capybara – all rodents. Can a squash kill a rodent? I think so. If you were to hit a mouse with, say, a 2 lb. butternut squash, I’d bet you would smoke it but good.